Y’know in the movies, when there is that ominous sound? Well, in my mind, the cute little dog isn’t included…but I have often heard a sound rather like that as the calendar approaches March 29th. My body could feel the day coming. The March breezes don’t have quite the bite that February winds do. We aren’t nearly at spring-like conditions, but we can tell we are heading towards it. I was gone with those little guys for their new boots for only about 40 minutes. Life was never the same after I got home. The man I was married to then, had planned the rest of my life with, slipped on that ice while we were out shopping and was hurt. Our lives took a sharp turn that day, never to return to normal. I used to think of that day as the beginning of the end. Life got complicated after that, and just over a year later, he left our home. When I thought of it that way, I spent a lot of time, “What if-ing”. The “woulda, shoulda, coulda”. I had spent a bit of time chipping at that mound of ice on the side walk, but had given up long before it was gone in the rush to get to making supper. It wasn’t that I didn’t notice that icy patch and recognize the danger–I did. But the fact was that I had children that needed feeding, help with homework and piano practice, and so on. We had timelines because Former Husband had a meeting to get out to that night, and so we needed to be ready for the evening for a certain time. There wasn’t time that day to take care of the ice. For a long time, I wished I had taken the time to take care of it anyway. For a long time, that ice patch, and what I didn’t do to remove it, haunted me. So often, in light of all that we know after, we get on ourselves for not doing something more or different before. Like somehow, we were supposed to magically know that something was important to do. All over the province right now are treacherous ice patches…some people removing their danger, most not. Those regrets in life are hard, aren’t they? Time taught me what the moment couldn’t: He would not have stayed, fall or not. The patch of ice may have impacted the timing, but not the outcome. 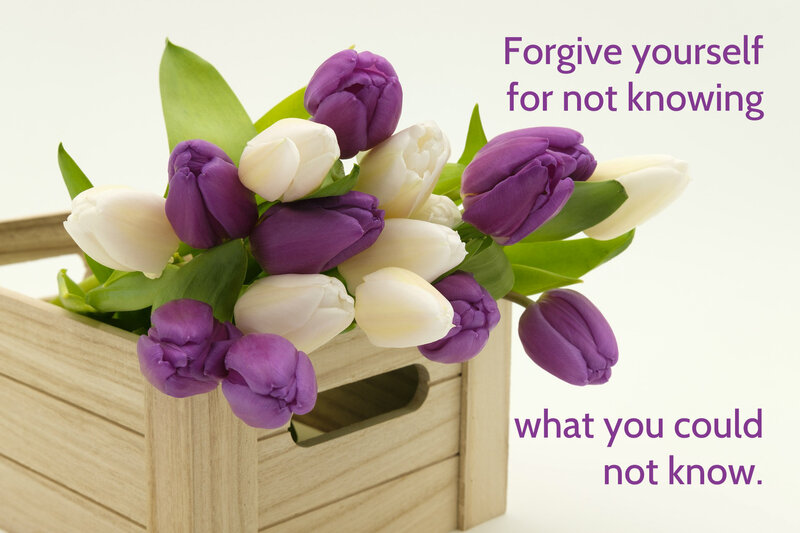 To forgive oneself is never easy. Sometimes, forgiving yourself for not knowing the future and not acting on it is especially hard, precisely because it’s unreasonable. Somehow, when one’s life trajectory changes for a seemingly mundane decision, one of a thousand that a person makes every day, we blame ourselves in a way that doesn’t make sense, but it very real. A lot of people told me to not blame myself. A lot of people said that it wasn’t my fault. It’s remarkable how we give ourselves so much power, isn’t it? We create a world where we should always know what’s important to do, what we should say, shouldn’t say. There is an expectation we have of ourselves to know, in advance of life actually happening, how something will turn out, and what we should do or say to make sure it turns out well. We regret our actions so often, when something goes wrong–somehow thinking that if we were smart enough, diligent enough, thoughtful enough, we could prevent all bad things from happening to our loved ones. Why do we expect ourselves to know everything, always, so that, we always, in advance do the exact right thing? It has me wonder how often we don’t give ourselves credit for reading a situation, taking proactive steps, and then averting disaster? We could never give ourselves a congratulatory pat on the back because we don’t even know how things would have turned out without having intervened. How you took a deep breath, and didn’t react to your child when he had a tantrum. That had him settle down and sullenly escape to play video games rather than running out of the house. That meant that he never ran across the street without looking and got hit by a vehicle. We won’t celebrate him not getting hit by a car because it never happened. Knowing that your child wasn’t looking quite right, you took her to the doctor, trusting your instincts. The antibiotics are started, and your child is just grumpy and you’re tired from it all. You won’t celebrate the damage that didn’t happen if you had ignored the infection for another 72 hours. Your child will never have been all that sick, and so the whole thing will pass by relatively uneventfully. Your husband was working too hard, and not spending enough time at home because of the big project at work. He was starting to enjoy the company of a colleague inappropriately much. Then his mother died, and the two of you travelled to the funeral. You were away together for a week. You were supportive when he needed you. He remembers all over again why he loves you and wants to be with you. And when he goes back to work, he works on the project, with his work colleague now nothing more than a respected colleague. You will never even know of the slippery slope. There’s probably a lot more that you do right in a day than you do wrong–but you’ll beat yourself up for the one wrong thing because it’s so obvious. My hunch is that you don’t acknowledge and celebrate all the thoughtful things you did well that made life go smooth. Smooth is not much to notice, and so it passes us by, almost all the time. I think it’s time we celebrate all the things we do all the time that make life safer, healthier, and better for those around us. Yes, we slip up occasionally. And yes, even more rarely than that, tragedy strikes because of those slipups. But how much more often don’t we keep ourselves and our loved ones safe because of our conscientious approach to all the little things in our lives? March 29th is a day I used to remember as the day I didn’t smash up that icy patch. It took years, but I remember now it mostly as another day. I now know, what I couldn’t then–it’s highly likely that another event or another trigger would have instigated the same outcome. was committed to being the best I could be as I was married and raising a young family. …but my family received all the love and care I knew how to give. I still wish that icy patch hadn’t had the nasty impact on him as it did. But now, I wish that as a compassionate human being doesn’t wish harm on another, than as a regret of personal failure. It’s a vulnerable thing to know that despite our best efforts, our careful planning, and thoughtful actions, tragedy happens anyway, isn’t it? Life has, inevitably, bad things that happen despite our best efforts. While that is scary for us to hold as reality, it is true. …we simply cannot eliminate the possibility of bad things happening. In an odd way, once we accept that reality, life becomes less harsh. The expectations we have of ourselves become more realistic. What do you need to let go of today, that you have been holding yourself responsible for? In what experiences of life do you expect yourself to know something beforehand that you couldn’t have possibly known? In what way do you hold yourself responsible for actions that in hindsight seem obvious, but at the time would not have? May you be kind to yourself today.